Several of the LifeEdited team are based in large cities like New York and Seattle, and unfortunately we are cursed with those great city’s myopic worldviews. There are certain things we deal with that we assume everyone deals with, like $2K/month studio apartments, locating reliable public restrooms and knowing cheap places to stay for guests when your place is too small. The company, founded in 2008 in San Francisco, lets you book rooms in peoples’ homes in 26K cities and 192 countries, often paying a fraction of what you would in a hotel. Conversely, you can rent out your space to earn some extra money. 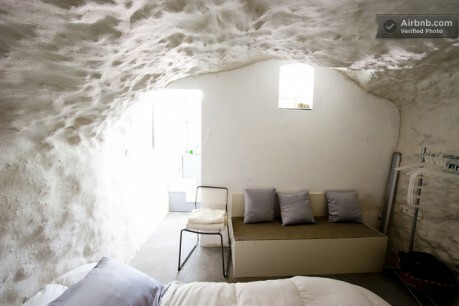 Beyond the savings, you can book spaces far more interesting that standard hotel fair–like a cave house in Granada Spain for $63/night (above) or a houseboat in Paris for $125/night. Funny enough, you can rent the 1 Sq Meter Home we covered the other day for $12/night in Berlin. On a more conventional note, you can rent rooms in places like New York City–where average hotel rooms are in excess of $300/night–for less than $100/night. Airbnb makes money by charging hosts a 3% processing fee and guests a 6-12% service fee (more expensive stays have a lower fee)–nominal expenses compared to a hotel’s overhead charges. Their website provides reviews of hosts and their accommodations, as well as profiles of guests to protect hosts. There are numerous safety measures in place, such as $1M coverage for theft or vandalism for hosts. Their system also allows you to network with your friends, so you can exchange information about various stays from people you know. Airbnb does require a couple extra hoops to jump through over a conventional hotel, like waiting 24 hours to confirm a reservation and you often have to coordinate a key exchange, so it might not put the hotel industry out of business just yet. That said, it creates a far more affordable, interesting and intimate way to house yourself when you’re away from home. Air BnB is a good idea, but here in New York City it has become a big problem. Here, there are strict sublet laws for the safety and comfort of residents who live on top of each other 24/7. Some tenants are warehousing apartments to rent to tourists, apartments they don’t live in. Tourists are not in NYC with jobs to get up for, with homework to do, etc., and there are many cases of loud parties, a revolving door in various apartments where other tenants don’t know who is coming in and out, or tourists knocking on others’ doors as if they are guests in a hotel… There are laws against this, but it is time-consuming to make a case and enforce it. Also, there are still plenty of rent-stabilized apartments in New York. These are boons for the tenant, and to make money renting them out as hotels by the night is antithetical to the guiding principals of rent stabilization. These are our homes, not hotels, and to have strangers coming in and out, who have no ties to the community and are in a vacation mindset, is a violation. Not every tourist is bad, of course. Far from it. But New Yorkers live in close proximity to one another, and, in addition to this practice being illegal in the city, it is damaging to our quality of life. thanks for you comments leslie. all fair. hopefully, these are growing pains for the system. perhaps it’s incumbent upon airbnb that people are letting out extra spaces rather than trying to make themselves homespun hotel impresarios. people should be nixed from the system should they abuse their rights as guests, e.g. parties and loud noises. as a new yorker myself, i am in favor of responsible airbnb use as there is nary any affordable places for people to stay in nyc…it’s preposterous. cheap is $175/night in most instances. hosting people in studios and 1-bedrooms is, for many, a strain on relationships. it also affords people to stay in neighborhoods where there a few or no hotels. e.g. my mother got an affordable airbnb stay near me, my wife and newborn in park slope, where there are virtually no hotel options.